Safely drain your carboy with this very handy drainer rack. Allows you to drain, and then dry, your carboy long before you need it. Bacteria fall down, not up so as long as carboy is in inverted position it should remain sanitary. What we like about this unit is the high drainage point allows for easier, faster draining, especially into a sink. As a full carboy drains your sink will build up water faster than it goes down most drains. If you are using a low profile drainer the neck of the carboy can end up below the water line which really slows drainage. 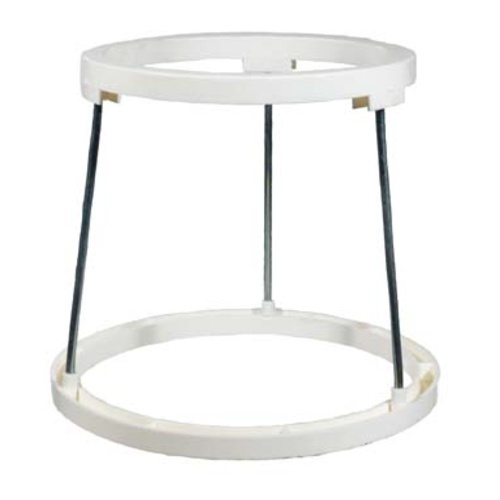 Constructed from a combination of plastic rings and stainless steel legs with a wide footed base. Made in USA by Brewmaster. Seen a friend use it and learned how useful it is. Love that it accommodates pretty much any type or carboy, regardless of size of carboy, size of opening (conventional or big mouth), or whether or not a handle is part of the carboy or attached to it*. Downside is that for some bizarre reason there is a small channel around the entire circumference of the bottom (larger) plastic circle, so water collects in it - better would have been to either eliminate the channel and make it one solid piece of plastic, or put the channel on the underside so water would not collect in it. Thank you so much for your feedback. Very excellent points regarding the carboy size compatibility. Reviews like this really help other customers decide which products they need. We really appreciate the honesty and value great feedback like this as it helps us improve our products. Cheers! It works fine, but it was tough to take apart the two plastic pieces which are molded together. They leave it to the user to break it apart. Kinda difficult. You also need three hands to put the legs on too. This is the only carboy dryer out there that I've found that woks with carboy handles still attached. Highly recommended for anyone using carboys. Carboy is stable in the ring, reducing fear of tip-overs. Has held up to one year of use. This is one of the best products for draining your carboys. All of mine have handles so the blue drainers were not an option. Highly recommend. this is useful for draining carboys for 30 sec or so, after that keeping a carboy upside down can trap moisture and allow mold growth, the best and cheapest way to go is clean & sanitize shortly before use. complete draining of a no-rinse sanitizer is not required. that being said, I had no issues with the construction and quality of the product and it holds carboys well. Didn't know I needed one till I bought one. The product itself is sturdy. Since there is little weight to the unit it can be less stable than you would perhaps want. With a glass carboy sitting on top it can wobble in certain circumstances(bouncy floors). Haven't had one fall off yet and I tilt the carboys for better run off. Much easier to buy this at an affordable price than to construct your own. I was hesitant to buy one as I figured I could get by using something else. I was wrong. This carboy drainer makes cleaning them easy. You won't regret it. I have several of these and they are great for drying carboys. This one is very stable and I have never had a problems with it. Seems well made, and for the price, you can't beat it. Sturdy and Effective! - Thrifty too! It's about time someone found a cheap and easy solution for draining carboys. I bought this to replace a blue plastic carboy stand that was utterly useless because it wouldn't fit without first removing the orange carboy handle which is not safe or recommended. This thing fits, and is very sturdy. I'm not worried about the wind blowing it over. Who want to take carboy handles off? And then invert wet, recently cleaned and sanitized slippery carboys and balance them upside down with no handles? Nobody, that's who. I have my 6.5 smooth neck carboys upside down in two of these right now. No problem at all, but I wouldn't place them in a high-traffic area with children and/or pets. That could be said of any glass carboy, though. When I received this I thought "wow a piece of plastic and 3 little rods", but I have to admit this is a very simple design that allows me to dry my 5 & 6 gallon carbons with the handles attached. No more balancing them in my plastic laundry sink hoping not to chip the neck! You can also take apart for storage which is nice if you are short on space. I purchased this stand so that I could clean and drain my carboys while leaving the handle attached. And for the purpose it works great!! So all in all, a great product for a great price. Only 4 stars because of the breaking hazard. Simple but effective. Don't know why I waited so long to purchase one! Works great for what it's designed to do and the price is right. I store my empty carboys off to the side on these stands when not in use. Recommend this simple but, useful product. As seemingly non-useful as it may appear, this cheap tool actually is pretty handy. It's your best bet for setting your carboy off to the side after cleaning and sanitizing and hoping to get as much of those pesky starsan bubbles out of your carboy. And since bacteria doesn't move against gravity, there's no worry of contamination- but I still wrap tin foil over the top just in case. I had a couple of the low profile "blue" drainers and gave them away once I got these. No need to remove the handle and they are pretty sturdy even with my glass 6.5 gallon carboys. I got this drainer because I wanted something that would allow me to keep my carboy handles on while I drained them. This definitely does the trick. I use this with my 5 Gallon and 6.5 Gallon carboys, and I have found it to be much more stable that it looks. With that said, I still find myself worrying that this stand will not keep my carboys from falling over if they get knocked into from the side (think kids, pets, drunk brewing helpers...). However, until someone develops a drainer that can accommodate a carboy handle, while offering more stability, this remains a very good option. It's not very sturdy, but for the price it's better than building your own. This is inexpensive and handy for drying fermenters. (I often also use it for kegs, but it's not really necessary for that.) I find it especially convenient for my brew days. I clean my fermenters after I use them (probably not on a brew day), so I need to sanitize the fermenter before I use it again. I simply slosh a Starsan solution through the fermenter and then set it upside down on the garage floor (where I heat my brew kettle). It'll probably sit there for a few hours. In this fashion, it'll be ready whenever I need it and the solution will have drained as completely as possible. Very handy. This carboy drainer looks a bit weak, but the posts are solid metal and the plastic rings are reinforced. I have used it with both a 6.5 gallon and a 5.0 gallon carboy and feel confident about its stability with both. The base is a smaller diameter than the 6.5 gallon carboy, so I wish it was a little bigger. On the other hand, it is already big enough that it doesn't rest quite right on the bottom of my sink (I use it on the floor and just catch water draining out in a quart measuring cup).